SJP isn't afraid of aggressive headwear, and if there's anywhere you can get away with rocking an elaborate headdress (and anyone who could even pull it off) it's Sarah Jessica Parker at the Met Gala. (Let's never forget 2013, the year that punk fashion died on the steps of the Metropolitan Museum of Art, and SJP wore a gold mohawk-inspired headpiece.) And this year, she did not disappoint. Parker showed up on the red carpet of the Met Gala in a gown designed in collaboration with H&M, paired with a headdress from Philip Treacy that definitely turned heads. I have to give Parker credit for going all-in on the evening's theme "China: Through the Looking Glass" and making an effort to stun the crowd. It's this willingness to go the extra mile and experiment with innovative, and slightly wild, looks that makes SJP a fashion icon, and why the red carpet and the Internet go crazy the second she steps out of her car. Love it or hate it, you have to admire the confidence it takes to wear such a bold headdress on such a global stage. While Parker's interpretation of this year's theme is definitely unique, her headdress still reminds me of... something. 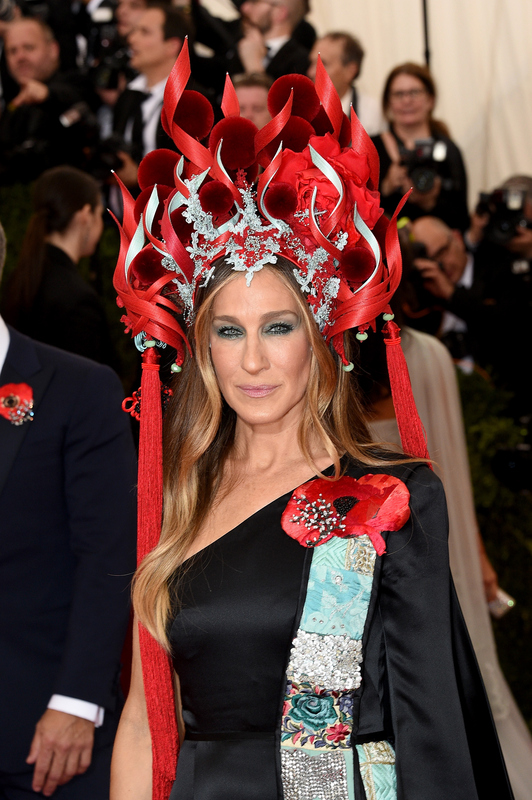 So here are five things Sarah Jessica Parker's fantastical headdress looks like. Those peaks and curly bits look like flames, especially in that deep scarlet. The light blue and red are reminiscent of the purple and red of a bird of paradise, and the pointy tips are definitely the petals. The red tassels hanging down from the sides are like the tassels that can be found on Chinese good luck charms and amulets, often given around the Lunar New Year. Maybe SJP wore this headdress to get some good luck? Although I can't tell what material her headdress is made of, it looks like folded paper. The structural shapes and bold primary colors remind me of the paper tulips and cranes I used to make in elementary school. To be honest, the first country I thought of when Parker walked up the red carpet wasn't China, but Thailand. That headdress kind of looks like it belong on a traditional Thai dancer... which hopefully wasn't the look she was going for.